This PS3 port just doesn’t cut it by today’s standards. It’s been seven years since the last attack on Earth from giant, killer insects. Seven years. It’s been seven years. Seven. 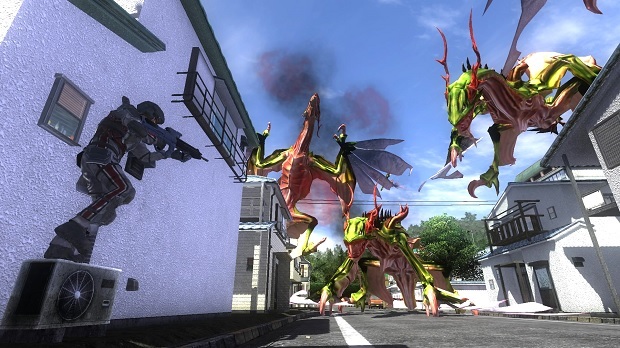 That’s what it sounds like when playing Earth Defense Force 4.1, a nonstop reminder of when we last fought these creepy crawlies. And after playing 4.1 I’m very confident in saying that it hasn’t been nearly long enough. Sandlot Games are back with a terrible, unoriginal and uninspired sci-fi story bunched with 1990’s PC voice acting and PS2 style graphics. When playing on Normal Mode 4.1 offers zero difficulty, and raising the level higher doesn’t feel much different either. If I didn’t know Sandlot Games were making this for the “fans” I’d have wholeheartedly labeled this game as pure, unadulterated shovelware. What looks like a 3D modeling of a lifeless cityscape of copy/paste buildings and frightened citizens (those of whom literally have no understanding for sounding scared) in a too-clean environment do not help define this world overran with giant bugs that look like they were found on a clip-art website. 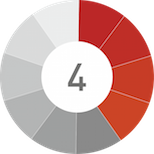 Dull, lifeless, bland colors that do not represent what a thriving city looks were used to their fullest extent. Green bushes, brown and grey buildings and cement are everywhere. "If I didn’t know Sandlot Games were making this for the “fans” I’d have wholeheartedly labeled this game as pure, unadulterated shovelware." Character models are a sad pile of PS2 quality engineering, and not even when the PS2 was starting to produce some pretty decent looking graphics either. It’s more around early PS2 style character models. They aren’t actually that terrible, but by today’s standards they are not pleasing to the eye in one bit. That’s all the bad this game has to offer. No wait. There’s more. The voice acting in this game is along the lines of the original Resident Evil game on PS1. Lifeless, unenthusiastic, and struggling to understand what empathy, fear, frustration, and war really sound like when trying to survive, these voices sound like they just finished their first class in elementary school theater. And they got an F on the exam. Just a bland, bad-taste-in-your-mouth cast that would have worked better if we could just read along rather than have to listen to it. That brings us to the story. This game takes place seven years after the last attack. Seven. Why does the game have to keep telling me this fact? I don’t believe anyone will be going into this game for the story. It’s as generic as any middle school student’s understanding for sci-fi can reach, with no real emotion, plot twists or true, understandable narrative mixed in. "Just a bland, bad-taste-in-your-mouth cast that would have worked better if we could just read along rather than have to listen to it." What does work in 4.1 is the uninspired gameplay. Uninspired, but it works. There are a nice number of weapons as well. It may be a pitiful looking, lifeless game, but the shooting is pretty good. Nothing to write home about, but at least they worked the bugs out on that feature. Feedback isn’t great however, recoil is nearly nonexistent, and ammo, new weapons and health boxes are beyond abundant. There’s no need to worry about running out of ammunition anytime during the more than 70 missions available just in single player. During cut scenes and during a few minor spots there is a slight problem with pop-in. 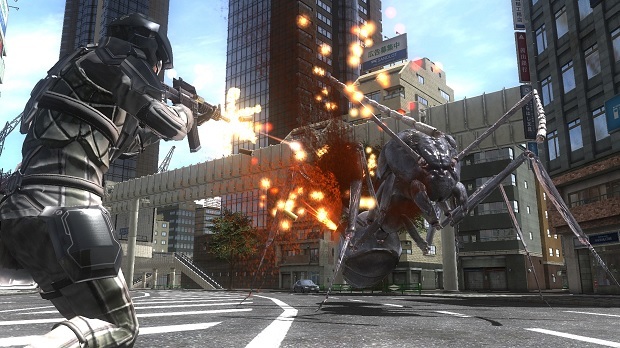 This seems incomprehensible as this is a port of a PS3 game (Earth Defense Force 4… Ah! Now you understand where the .1 comes from!). Over 70 missions! That sounds amazing! But it’s not. Each level is almost an exact replica of the one before it exchanging a bug or two every four to seven missions. What is a nice touch is adding 1v1 split screen mode in there. Doesn’t add much, but it’s there. "Over 70 missions! That sounds amazing! But it’s not. Each level is almost an exact replica of the one before it exchanging a bug or two every four to seven missions. " What this game does deserve in credit are the upgrades and classes for the characters. There are some neat upgrades such a jetpacks and laser weapons, and a few more pretty neat additives, but that’s just it: they’re neat. Not enormously enjoyable or entertaining past a few missions. If players can be found, 4.1 offers a nice co-op-style online mode that tasks a unit to stop certain enemies in a certain amount of time. Nothing terribly original and actually somewhat fun. The graphics remain the same as in single player and the framerate is steady most of the time. For those who want to enjoy what is essentially a Nintendo DS handheld-mission-style game on PS4, where objectives are actually short and mindless rather than long and arduous (thankfully), this game is perfect for them. For those who want to sink their teeth into a game designed to be fun, long lasting and above all else interesting, leave this title on the shelf because it’ll be in the bargain bin in a few more weeks. Weapon selection and character upgrades are decent. Poor graphics, bland story, voice overs and missions. 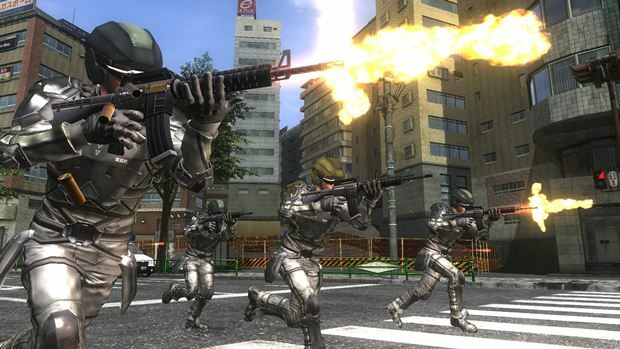 Earth Defense Force 4.1 is a game only for diehard EDF fans. Other than that it will look and play like a shovelware title that can be found on the Wii back in 2005.